Manipur is one of India’s plush green states with a natural beauty. The state of Manipur is located in northeastern India and its capital city is Imphal. The state is bordered the states of Nagaland to its north, Mizoram to its south, Assam to its west and the country of Burma to its east. It has a land area of 8,628 square miles and a population of 2,721,756, making it one of India’s least populated states. The state was originally established as a Union Territory in 1956, but became a state in 1972. The indigenous people of this region are called the Meiteis; they make up about sixty percent of the population and primarily live in a valley region of the state. Several minority groups make up the other 40% of the population that live in various areas of the state. The state was placed under British rule as a princely state in 1891 and remained as such until 1947, when it India gained its independence from Britain. Its existence as an Independent state is a complex story. During World War II, the state was the scene of multiple battles between the Allied Forces and the Japanese. Following the war, the Manipur Constitution Act of 1947 created a democratic government with a Maharaja (king) as the head of state. Two years later, the Maharaja was sent to the state of Assam. Following his departure, the state government dissolved and the region became a Union Territory. Meiteilon is the state’s official language and the language most tribal people speak here, but English and Hindi also spoken here. The written language of Meitei Mayek has been used since ancient times, but the Bengali script has become more popular. The state houses a lot of Universities including Manipur University, Central Agricultural University, Regional Institute of Medical Sciences and more. The primary religions followed here are Sanamahism, Judaism, Islam, Christianity and Hinduism. Sanamahism is an ancient religion where people worship the Sun God named Sanamahi. Worship of Sun Gods was common in many ancient India societies. There is rich culture here; people here love live theater and incorporate it into festivals. Theater performances can be based on religion or themes based around life-drama; plays about the God Krishna are very popular. Could Manipur be the Broadway of India? Perhaps! Classical dance is important here as well; it's inspired and based on the love story of the Hindu deity Lord Krishna and Radha. Their dance is a slow dance with graceful movements; in a way, you could say it's like India’s form of ballet. 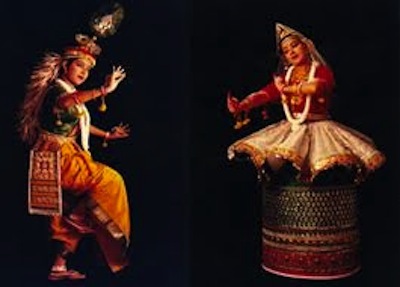 Plays and dance performances are often shown in the state’s auditorium, located near the capital city of Imphal. A popular sport played here is Polo, Sagol Kangei. According to history, Manipur's former King Kangba introduced the game in 33 AD. Another popular game born in the state is Yubi Jakpi, which means coconut snatching. Yubi Jakpi is like British Rugby, but with a coconut as a ball. Football (soccer) is also popular. A number of festivals are celebrated in Manipur. Ningol Chakouba is a festival where married women and their children are invited to feast at their parents home and they receive gifts. In India, after women leave their parents' home, they rarely see them; this is a common tradition.Yaoshang is a festival that includes moonlight dancing! Men and women dance in a slow circular motion under the light of the moon. Christmas is celebrated amongst the Christians living in the state and The New Year is rung in during the last day of March and first of April. The state has four major rivers that supply its water; the western Barak River Basin, the centrally located Manipur River Basin, the eastern Yu River Basin, the northern Lanye River Basin. Two topographical layouts really encompass the land; rough hills with low valleys, and flat plains. A major lake called Loktak Lake is located in the central plain and the state is 790 meters above sea level. The temperature ranges from about 45 degrees Fahrenheit in the winter to 92 degrees in the summer. The state can see snow in the winter and is drenched in rain from May through October. Despite the fact that you may need a government issued pass to visit, Manipur is a great place to visit. Its plush green landscape and moderate climate make it a great tourism destination. Visitors can see Loktak Lake and its amazing floating islands, rare brown antlered dear and other rare mammals at Keibul Lamjao National Park, the trading district of Moreh on the Burma border, zoological gardens, war cemeteries and dine at hilltop restaurants overlooking the serene Loktak Lake. Leave Manipur to visit other states of India. Visit our homepage and continue to explore India culture, history, food, arts and more!